The Soyuz MS-09 rocket heads to space with three Expedition 56-57 crew members after launching on time from the Baikonur Cosmodrome in Kazakhstan. The Soyuz MS-09 launched from the Baikonur Cosmodrome in Kazakhstan to the International Space Station at 7:12 a.m. EDT Wednesday, June 6 (5:12 p.m. in Baikonur). At the time of launch, the station was flying about 250 miles above south central Egypt, moving from southwest to northeast. 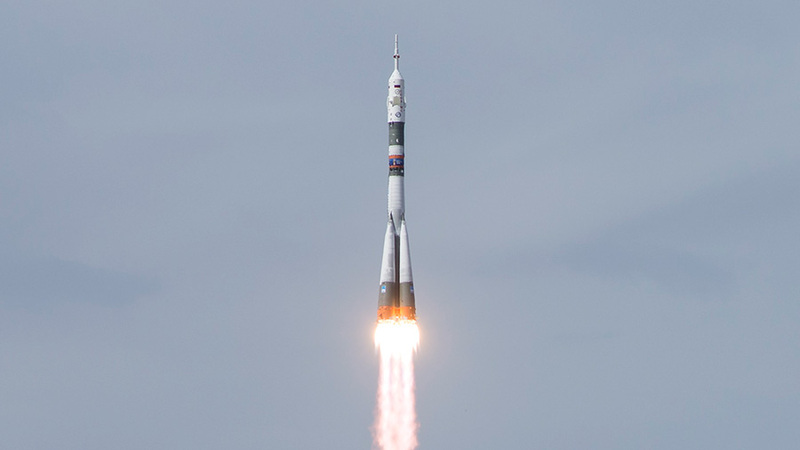 NASA astronaut Serena Auñón-Chancellor, Alexander Gerst of ESA (European Space Agency), and Sergey Prokopyev of Roscosmos are now safely in orbit. The crew will orbit Earth 34 times before the spacecraft’s arrival and docking to the space station’s Rassvet module at 9:07 a.m. Friday, June 8, which will air on NASA Television and the agency’s website, followed at 10:30 a.m. by coverage of the opening of hatches between the spacecraft and station. Was it possible to see trails from the rocket around 6pm EDT from KY-USA? Thanks! This is so amazing. Space is slowly getting humane. Congrats NASA!